I love to create unusual objects out of all kinds of textiles using all kinds of techniques from knitting and crochet to beading and needlefelting. I often create objects that are used everyday like purses and jewelry, but this trout called for something special. As soon as I saw it, I knew a fish living in the chilly Esopus needed a fisherman knit sweater. But I love color and couldn't bear to create a normal off-white Aran knit sweater. When I found out that the local species of trout are called "Wild Rainbows", I had my answer. 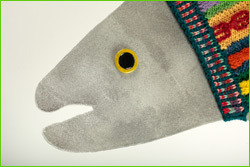 I also love to knit cables, and used three different traditional cable patterns for this fish. The perfect finishing touch is an antique button I acquired at an auction many years ago, just waiting in my stash for the right project. Alisa Brown grew up on the West Coast and moved East in high school with several summers spent outside of Chicago. She learned to sew and embroider from her mother, and her grandmothers taught her to knit and crochet. She completed the Worcester Center for Crafts Professional Fiber Arts program in 1993. There she added screenprinting, dyeing, weaving, and felting to her repertoire. 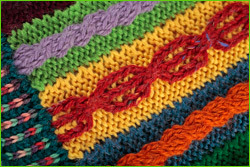 She combines techniques from these and other fiber art techniques to create her unique designs. Alisa creates colorful textured knitted and felted purses and totes and crocheted and beaded jewelry which she sells at local craft events and in her etsy store. Her needlefelted wall pieces (pictures made out of felted wool) can often be seen at the Arts Upstairs Gallery in Phoenicia, NY.